Welcome to another challenge theme at Fashionable Stamping Challenges. This fortnight it is STEAMPUNK. Remember this is a stamping challenge so bring out your stamps and have some fun!!! I have gone with a steampunk stamp sheet from Oxford Impressions, because I love this bird! Even though I’ve had this stamp for AGES…it’s not one I have used very often. This time I have settled for stamping it on acetate with Stayzon Ink and working some alcohol inks behind it…and then layering it onto white cardstock that is lightly sponged with DI’s. Then I layered it again onto torn card. I have dipped (carefully) the edges of the acetate and torn card into melted UTEE for a chunky metallic feel. And used some droplets of UTEE for studs around the edge. – Rainbow Lady’s Challenge Blog ~ Let’s get inky! – Southern Girls Challenge ~ About the Boys! No, this is not cool at all! No, this does not rock at all! Dot, I just love all the interest and depth in this Bionic Bird wonder, right down to his hat! AWESOME! Hi Dot, this is absolutely amazing, so many gorgeous colours and so much dimension – a real piece of art! 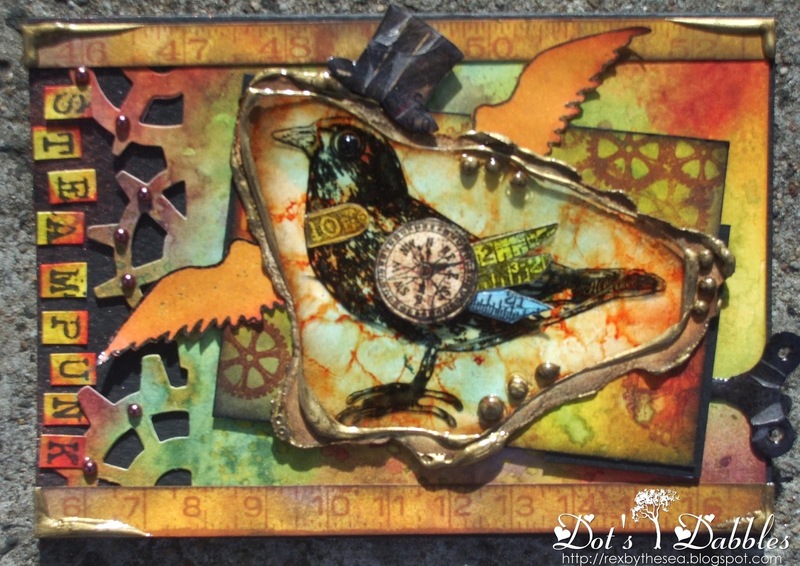 Oh this is just fantastic – love the mechanical bird & perfect for the new So Artful Steampunk theme! Just stunning Dot! Your background looks amazing and the colours are wonderful. Just love what you've done with the bird too which looks fabulous! Wow, awesome card, love how you did the bird and the colours are fabulous. Love your title for this Dot. An amazing creation, such depth to the colours and wonderful bird image. How interesting. I have all the O.I. Steampunk sets and used all the stamps on all the sets except, you guessed it, the bird. I must remedy that after seeing this inspired card. Wow, very inky, Dot. Thanks for joining us at Rainbow Lady. This is stunning Dot. Love the bird and his UTEE frame, just brilliant. Love the colours you have used on the background. Fabulous piece of artwork – just right fo Rainbow Lady's Inky challenge. Thank you for sharing it with us. Hi Dot what a fabulous lady you are and so creative which shows through in this amazing card, stunning. Dot, that rocks. Such a fantastic colorful steampunk creation.